You don’t have to go to the beach for a plate of piping hot shrimp and hush puppies. Calabash is a tiny fishing town in Brunswick County. 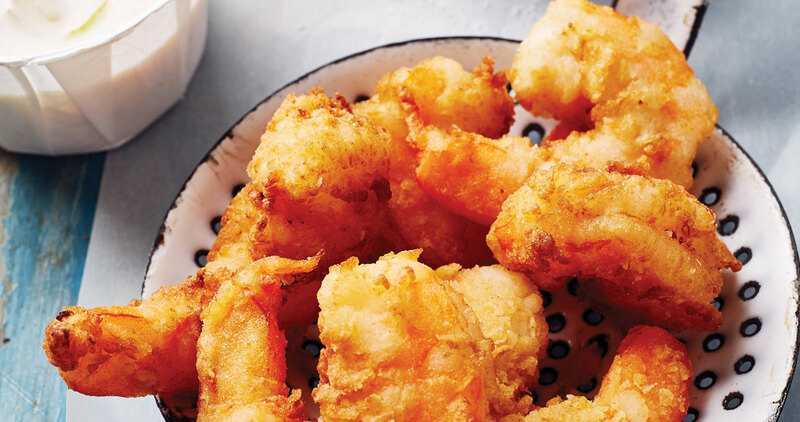 Only about 2,000 citizens call Calabash home, but the community says it’s “The Seafood Capital of the World.” Calabash-style means perfectly fried seafood with a light, crisp, ethereal battered crust. For many vacationers, no trip to the beach is complete without a pilgrimage for a plate of piping hot shrimp and hush puppies. Pour oil to a depth of 3 inches in a deep fryer or deep, heavy pot. Heat over medium-high heat until the temperature registers 375° on a deep-fry thermometer. Adjust the heat as necessary to maintain the oil at that temperature throughout the frying process. Whisk together the eggs and milk in a shallow bowl. In a second shallow bowl, whisk together the flour, salt, and pepper. Working in batches, coat the shrimp in the egg mixture, letting any excess drip away, and then coat lightly and evenly in the flour mixture. Slip the shrimp into the hot oil, adding no more at one time than can float freely. Cook until the crust is crisp and golden brown, 2 to 3 minutes, depending on the size of the shrimp. Transfer with a wire skimmer or slotted spoon to drain on paper towels or a brown paper bag. Sprinkle the piping hot shrimp with salt and serve at once with sauce on the side. Serve with tartar sauce and/or cocktail sauce.